The Korean production of the Broadway musical “Once” will star veteran rocker Yoon Do-hyun alongside an up-and-coming musical actress, the show’s creators said. Yoon will play Guy, the Irish street musician and vacuum cleaner repairman who falls in love with Girl, a Czech flower seller, in the Korean theatrical adaption of the 2006 indie film. Set to open at Seoul Arts Center in December, it is the first non-English production of the show, which debuted on Broadway in 2012 to both critical and public acclaim. “I auditioned for it, because I wanted to be in it so much,” Yoon said at a press conference Monday. It was his first-ever audition, he added. Yoon is an established musician with a nearly 20-year career as the leader of the rock band YB. He has so far released nine albums with the band and two solo albums. His third solo EP is on the way. Like the character, Yoon can’t separate life from music. Like Guy, he grew up playing the guitar, he said. Still, for “Once” he is having to hone his craft. “I gave guitar lessons in the past, but now I am taking lessons for this musical,” he said. Every member of the cast has undergone a long audition process, Park Myung-sung, president of the production company Seensee, said. The show is basically about musicians and their spontaneous music-making, and there is no other way to do it on stage than actually doing it for real. Aside from the two lead characters, who are both musicians, each member of the 10-person ensemble must function both as part of the show’s band and its cast of characters, Park explained. Along with Yoon, musical actor Lee Chang-hee will play Guy opposite two emerging musical actresses, Jeon Mi-do and Park Ji-yeon. “(‘Once’) will be very different from what Korean musical fans are used to seeing now,” he said. Unlike big shows with spectacular backdrops, loud music and dramatic plots, “Once” is very simple. It takes place on a single set and the cast members are dressed in street clothes. There is no orchestra in the pit. “There are many over-the-top shows, but this one will touch your heart with its simplicity and genuineness,” said Kim Mun-jeon, the Korean production’s music supervisor. 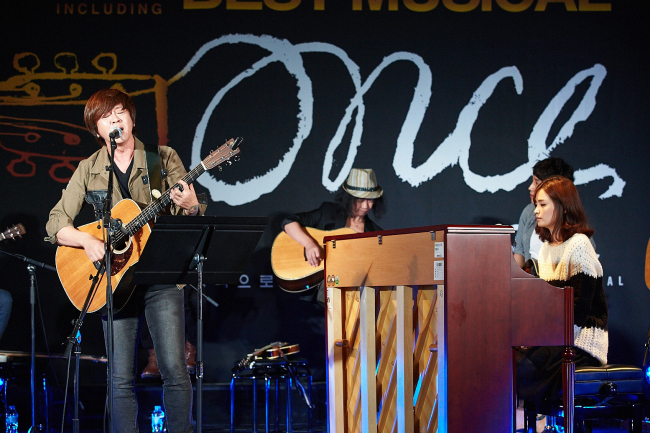 “Once” will run from Dec. 14 through March 29 at the 1,000-seat CJ Towol Theater of Seoul Arts Center.